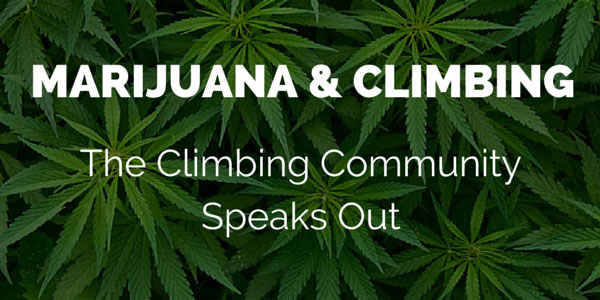 Here at Training Beta, we recently conducted a survey about marijuana and climbing. We were specifically interested in the climbing community’s thoughts about marijuana’s effects on climbing performance and about the presence of marijuana at climbing areas in general. Dave Sheldon compiled our survey results and wrote this article in an attempt to answer these questions. Based on general perception, the obvious answer is that marijuana is not performance enhancing. This conclusion also resonates with the findings from a 2003 study from the Laboratory of Analytical Toxicology, College of Pharmaceutical Sciences, University of Sao Paulo, Sao Paulo, Brazil. “Due to its ergolytic action, the use of cannabis as doping will not help to gain a competitive edge by any means. Cannabis makes the heart work harder and limits sports performance. It increases heart rate and de-creases cardiac stroke volume…Drugs, such as cannabis products, can be very serious in dangerous sports that rely on clear minds, quick reactions and split-second timing”. A well researched 2011 review authored by members from the Chemistry and Drug Metabolism, Intramural Research Program, National Institute on Drug Abuse, National Institutes of Health, Baltimore, MD, USA, and the World Anti-Doping Agency, Montreal, QC, Canada also speaks to the negative effects of cannabis on sports performance. “Cannabis can alter the perception of risk, potentially leading to poor decision making and/or risk for the athlete and their entourage. With negative influences on coordination, movement and time estimation, cannabis can impair essential technical skills that may also increase the probability of accidents and injuries, particularly when handling equipment or when high velocities are involved. CB1 receptor density in the cerebellum (involved in motor control and movement) and prefrontal cortex (involved in decision making and executive function) is high”. “Cannabis improves sleep and recovery after an event, reduces anxiety and fear and aids the forgetting of negative events such as bad falls and so forth. Cannabis enhances sensory perception, decreases respiratory rate and increases heart rate; increased bronchodilation may improve oxygenation of the tissues”. “In France, in 2002, 25% of IOC positive tests were for cannabis, prompting Lorente et al. to conduct a survey in France of 1152 sport university students on their use of cannabis. Based on the students’ survey responses, the relaxing properties of cannabis were frequently used to enhance sports performance. Surprisingly, the higher the students’ level of competition, the more cannabis was employed to enhance performance… Anecdotal evidence from blogs and drug hotlines also indicates that athletes abuse cannabinoids to enhance sport performance. Athletes under the influence of cannabis indicate that their thoughts flow more easily and their decision making and creativity is enhanced; others claim that cannabis improves their concentration or reduces pain”. Although both of these studies do a good job of detailing how cannabis may hinder or help sports performance, nowhere is climbing and its unique combination of fitness, motivation, coordination, memory, and mental resilience considered. Climbing is also one of a few sports where a mistake can result in death, and for some, it is this excitement that provides part of the reward. (Ironically, the underlying fear of dying can have profound negative effects on climbing performance. Think of all the times you’ve seen a buddy “take” during an onsite or red-point attempt out of fear rather than physical exhaustion). In an effort to get a little closer to the answer, we decided to take matters into our own hands and sent out a survey on June 11th entitled, “The Marijuana Survey.” Four weeks later, we are ready to share the data gleaned from the 1,462 respondents. 72% of the respondents have been climbing between 1-8 years. 75% climb or train 2-4 days a week. 65% never mix climbing or training with cannabis. 37% are not bothered being around those who are using marijuana. 43% feel their comfort depends on the people who are high and the setting they are in. 46% responded that feeling comfortable being belayed by someone who is high depends on the person and setting. 6% are fine with high belayers. 47% are not comfortable with high belayers. The minority who do partake while training and climbing listed the benefits as: pain reduction, lowered anxiety, and improved recovery, motivation, coordination, and focus. Another set of respondents answered that they had mixed marijuana with training and climbing and experienced the negative results of increased anxiety, reduced motivation, coordination, and focus including a reduction of both basic and safety related decision making skills. If cannabis does increase sporting performance, should it be grouped with steroids, HGH and testosterone as making a significant change in an athlete’s physiological output? The vast majority of the respondents think not. (90% thought marijuana should not be considered a performance enhancing drug, 10% thought it should be classified as such). Interestingly, the World Anti-Doping Agency classifies certain compounds found in cannabis as performance enhancing but only during competition. If cannabis use is detected in an athlete’s system outside of competition, the athlete is not sanctioned. Considering how differently marijuana effects one individual to the next, it is safe to say that we have not reached a definitive answer to the performance question. What we do know is that for some the effects of ingesting cannabis have performance enhancing attributes, while for others, it decreases both performance and safety.